﻿These sessions are taught by trainee teachers, overseen by their tutor and a supervisor, and are for children aged 4-15. They are usually 2 hours long, split into four 30 minute lessons and cost £5 per child or are free for Brighton Swimming School customers. Dates are emailed on a monthly basis and you can book into as many dates as you like; booking is essential as we cannot guarantee there will be space unless you book. All sessions will take place at Brighton Swimming Centre (Eastern Road, Brighton, BN2 5JJ). 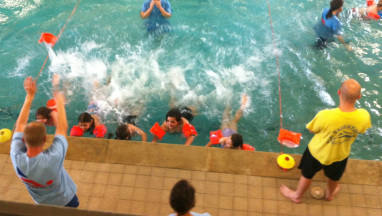 All sessions are overseen by 2 RLSS qualified lifeguards, a supervisor and ASA tutor. Free Swimming Teachers for Schools! Swim UK based at the Brighton Swimming Centre in Eastern Road are offering free swimming teachers to bolster school swimming lessons taking place at the Centre. Swim UK’s Amateur Swimming Association tutors and student teachers have been assisting schools using the centre by merging swimming teacher’s courses with participating school swimming lessons. Swim UK are now offering schools the great opportunity to have swimming lessons for free as a way to advance their development in the activity. With class size averaging just 3 pupils, children can get great swimming lessons for free as learners on ASA courses are taught how to teach children to swim under the guidance of an ASA tutor. All sessions are also overseen by at least two RLSS qualified lifeguards. For more information please call the Swim UK office on 01273 434400 & select option 2.